These are the only pictures on this website so far that I didn't take myself. I think they are so epic that I wanted them up here. 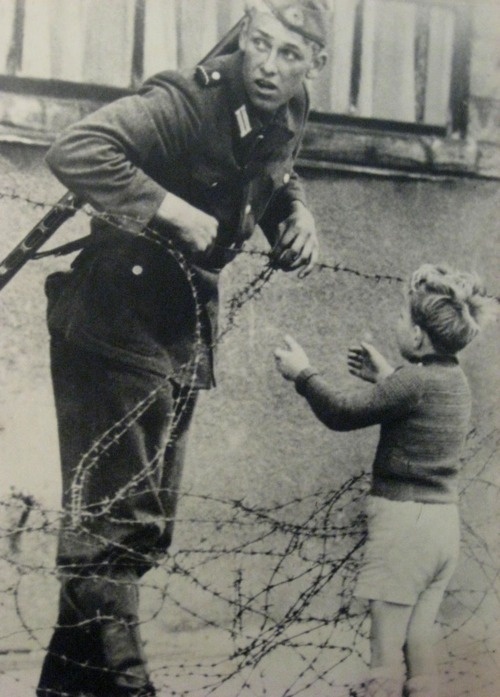 An East Berlin guard helps a boy escape. Apparently, the guard was spotted and later replaced with a better comrade. I am just old enough to have visited East Berlin on my own, and have the photos to prove it (which I will post eventually). The way the guards looked at you, or rather through you, was truly frightening. I went in by subway and tried to leave on foot by Checkpoint Charlie, but was politely told you had to leave the same way you came in. I eventually made the long walk back to the subway and stood on an endless line to have my passport examined and be glared at by the guard. I wasn't trapped in any way, shape or form, and there was nothing epic about my experience whatsoever. However, it was weird to have my freedom of movement restricted in that way, something many people (thankfully) will never experience. Crossing the land border between Greece and Turkey was very similar, couldn't go by foot, only by car. Here's another one, also not by me obviously. 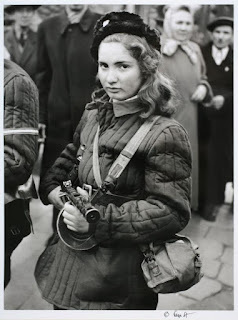 Erika, a 15-year-old girl, was a Hungarian Freedom Fighter. Here, she carries a machine gun in Budapest during the 1956 revolution. She eventually was shot by the Soviets. Photo is by Dutch photographer Vagn Hansen.